The real beauty of the reverse wash system was how it magically turned my dried-out strands into soft-as-silk hair that managed to feel light and clean, too. I basically never break the rules, beauty or otherwise. As a kid, if the teacher left the classroom during a test, I was that nerd who kept working while everyone else frantically flipped through their books or shared answers. And as an adult, I take my makeup off every night, without fail -- even when it's really late and the only thing around to remove my makeup is some warm water and a hand towel (sorry to all of the hand towels I've destroyed). 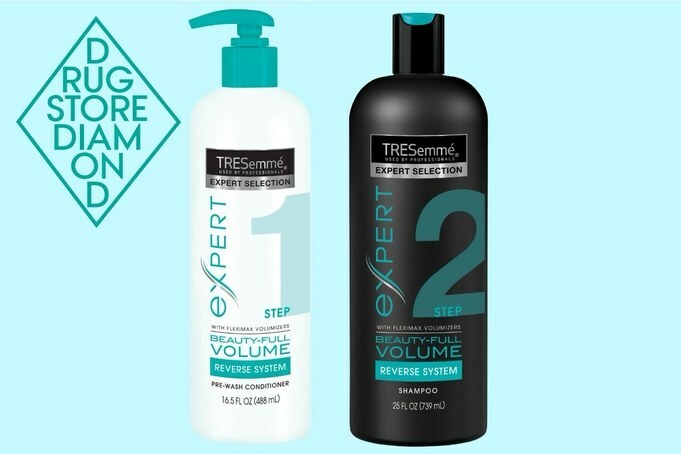 That's why when I first saw Tresemmé's Beauty-Full Volume Reverse Wash System, where the conditioner is used before the shampoo, I was skeptical. Not only does that go against the hair washing rules I've been following since I was a kid, but applying a conditioner, not just on the ends, but through the mid-lengths and roots of my fine hair seemed like the surest way to leave my hair coated in oil. Still, all of my friends kept asking me about it, and since it's kind of my job to try out beauty products, I took one for the team and gave it a go. On the outside, the duo look just like any other shampoo and conditioner that's ever inhabited my bathroom, except that the conditioner is labeled with a giant 'Step 1' and the shampoo, 'Step 2,' so there's no possible way you can screw things up. The Pre-Wash Conditioner comes in a pump bottle so it's easy to apply the instructed amount (two to three pumps) to your hair. Using the conditioner first and applying through my hair evenly (yes, from root to tip!) really freaked me out, but there's a method to this madness. Basically, since conditioner is thicker than shampoo, using it last leaves your hair weighed down, which is what makes it look flat and basically just hang there. By using conditioner first, you still get all of the moisturizing benefits, but your hair won't be left coated in gunk since the shampoo washes it all out. Once I let the conditioner sit for the recommended minute and rinsed, I gave my hair a quick shampoo and stepped out of the shower hoping for the best (or really, just for my hair to not be a greasy mess). Combing through my hair proved to be infinitely easier than it normally is. I usually spend a good five minutes ripping through the knots in my well-below-the-shoulder-length hair (which, I realize, just makes the problem worse in the long run). But, after the Tresemmé system, I was pleasantly surprised and quite shocked to find my comb didn't catch on a single knot, meaning fewer split ends in the future. Since I first tried this out over the weekend and I refuse to put any effort into my hair on a Saturday afternoon, I let my hair air dry after combing without adding a single product to it. Once it had finally dried, I noticed that not only was my hair without a hint of grease but even better, it didn't sit flat at the top of my head like it usually does. Instead, my hair had a slight boost at the roots and soft, bouncy volume through the lengths that made it look and feel much healthier than it had pre-shower. But the real beauty of the reverse wash system was how it magically turned my dried-out strands into soft-as-silk hair that managed to feel light and clean, too. Even after a week of faithfully using the conditioner and shampoo, my hair didn't revert back to its original state like it tends to, but left me with the same soft volume on wash 12 as it did on the very first wash (and pre-wash). Proof that sometimes it's okay to break the rules.